The photo doesn’t do the Pavlova justice. It was in its stages of demolishment, when I realised “oops, forgot to take the photo-finish”. Now although this can feed around 6 to 8 people, in my family, my parents especially my father can polish this off himself, with no help. His excuse, is that its simply more-ish melt in your mouth…once you start you can’t stop. Thus the picture you see! And it is so simple to make…. Now the trick is to take a springform tin (not using the bottom pan) and cover it with tin-foil. 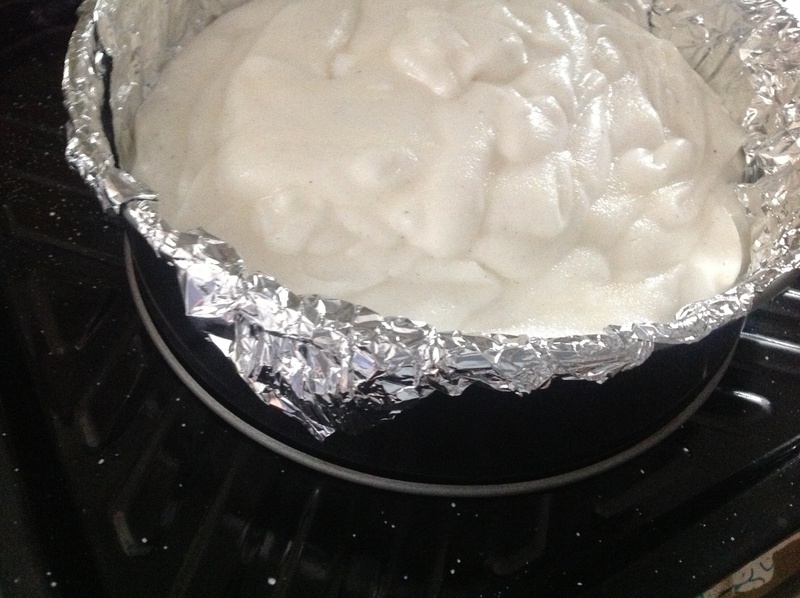 Once the meringue mixture is done, simply pour the mixture into tin-foiled lined tin, which is on a baking tray and bake in the oven. No need to worry if the mixture is robust enough to hold its shape when baking, the tin ensures you have a shape and form! Beat the egg whites until you have soft peaks. Tip: don’t throw the egg yolks away, place in a container in fridge to make creme brûlée or custard or sabayon! Beat 250ml of castor sugar for 1 minute into the egg whites. Mix together well the cornflour, extract and the vinegar. 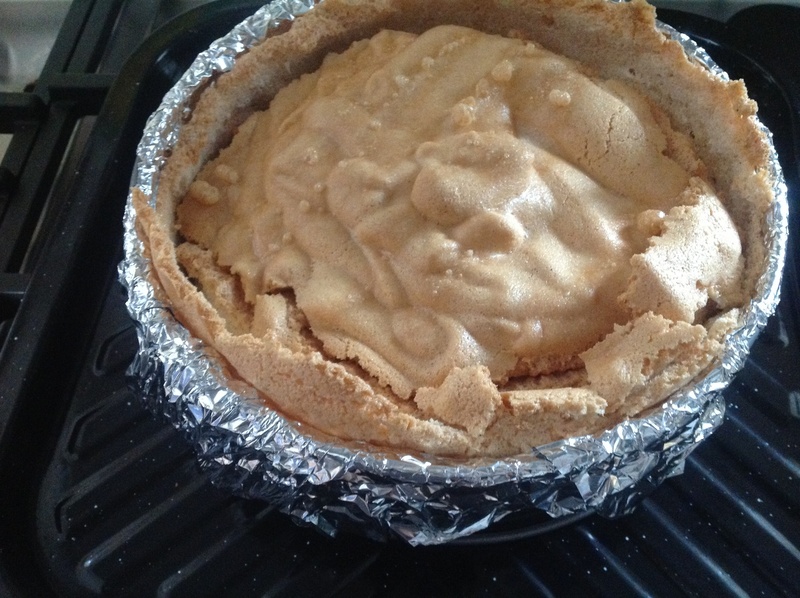 Pour into the tinfoil lined container. Bake for one hour. Switch oven off afterwards and keep it in oven for further 30minutes. Now remove from oven. Don’t be surprised that it “collapses” – it will. Now to decorate and to finish, you do as follows. Place the above upside down onto a large enough plate that you will be presenting on! Take off the tin-foil. Whisk some cream (250ml full fat) until it is stiff. Spatula out onto the top of the “meringue” – this covers all the cracks/collapses etc. Cover now with fruits of the season: particularly delicious on it are lychees, mangoes, strawberries, papaya, granadilla and the like. I like to also sprinkle some cinnamon or mixed spice over it, to add extra flavor. Another tip: you can use half cream, half mascarpone, if you want a more rich but subtle taste. And there you have it….voila!!! It’s a dessert, that everyone keeps coming back for and keeps requesting I make, and yet it’s one of my simplest and “lazy” options. 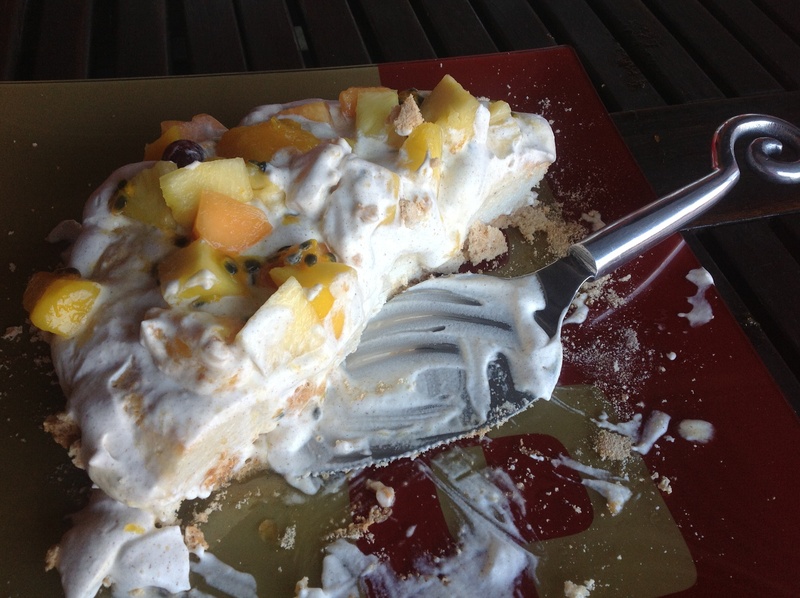 This entry was posted in Baking as easy as 1..2..3 and tagged cream, egg whites, fruit, meringue, pavlova by angelb38. Bookmark the permalink.